These charts come to us courtesy the “Graphic Content” portion of a Wall Street Journal online edition I only recently stumbled upon. 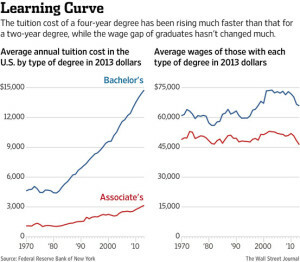 Here we have a succinct capture of the dilemma facing every college attendee today: the costs of college continue to go up at a consistently rapid pace while the earnings of college graduates have been in decline as of late. I appreciate this combination of charts laid side by side. Of course, cost data only tell part of the story. Here we also get to take a look at the rise of college costs 1) in relation to inflation at large (everything has been converted to 2013 dollars), 2) in relation to the the economic benefits, and 3) according to type of degree, along with the benefits likewise. However you cut it we get a pretty grim picture of students face today. 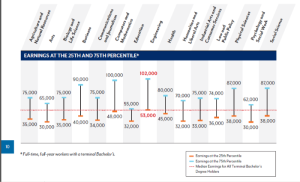 Chart: Why Widening Wage Gap by Education Level? 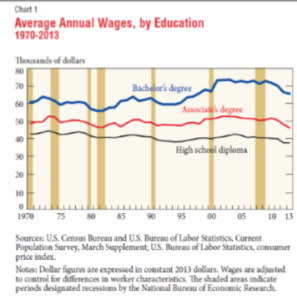 Chart(s): Why is the Educational Level Wage Gap Widening? 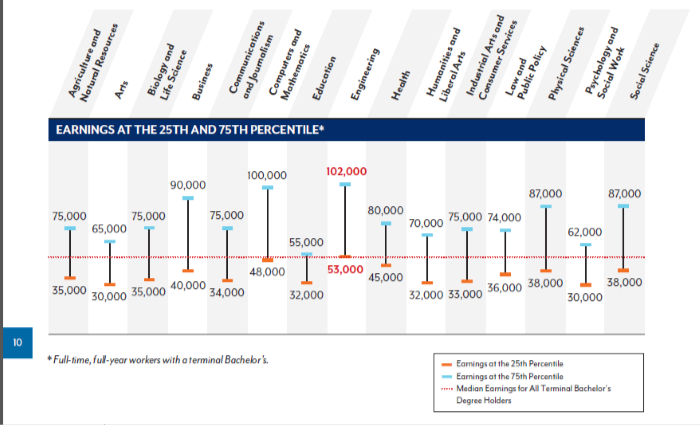 Our chart comes to us from a treasure trove of college-related statistical breakdowns from the Georgetown University Center on Education and the Workforce. The report, titled “What’s it Worth? 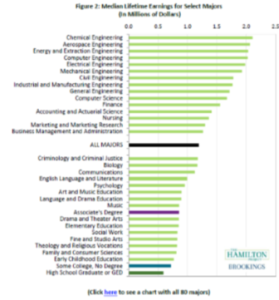 The Economic Value of College Majors” was compiled by Anthony P Carnevale, Jeff Strohl, and Michelle Melton. They have also offered a less onerous set of select findings which includes today’s chart. Hats off to the consulting firm PayScale, providers of this chart. 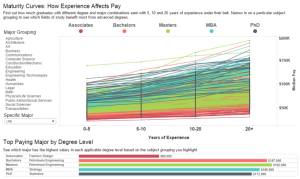 This data-intensive and interactive feature displays not only previously seen earnings by major or lifetime earnings by major, but also the value of job experience over the course of a given career. If you play around with the chart for a while you quickly see not only the degrees/careers that pay more from the outset, but also those which reward (or not) years on the job. For instance, not only do early childhood education majors face dim wage prospects from the outset, they also don’t get much relative boost in pay in return for being on the job for a long period of time. 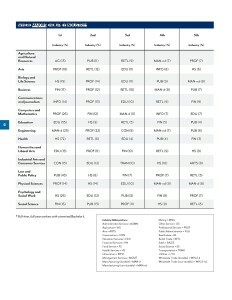 Starting salaries run about $30,000 and after twenty years in the workforce median pay has only increased to $41,000. In contrast, almost any engineering or technical degree can expect consistent and healthy pay raises along the way. This shouldn’t necessarily discourage anyone from pursuing this or that major, but certainly should temper one’s expectations of long-range returns. 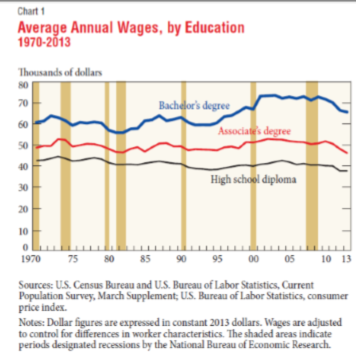 Many jobs may start discouragingly low on the totem pole in wages, but the promise of steady pay increases or brighter job prospects in return for sticking it out makes the education and early struggles worthwhile. Meanwhile, other careers will continue to hold you back with little hope of progress if you start out on the wrong foot, i.e. with a boatload of debt and other bills to pay. We’ll explore this pain vs gain dynamic in our next Tip of the Week when I walk you through a process whereby you can calculate your expected Return on Investment (ROI), which will then enable you to properly determine the maximum out-of-pocket costs you should pay, depending on your career plans, in order to get to and through your chosen career in one piece. This information comes to us from an academic research paper titled “Dropouts, Taxes and Risk: The Economic Return to College Under Realistic Assumptions.” The authors, Alan Benson of the University of Minnesota and Raimundo Krishna Esteva and Frank Levy of MIT, sought to pick up on factors that mainstream data crunchers miss. Specifically, most prevalent calculations dealing with “return on investment” (ROI) payoffs of a degree infer a series of best-case assumptions, specifically 100% student graduation rates, graduations after four years, and equal tax liabilities. But what are the returns according to more modern, realistic assumptions? So far we’ve explored ensuring affordability by running two sets of necessary filters: how to narrow down your college choices by priority so as to not run afoul of opportunity costs (Rank), and how to know how much college you can your income and assets will allow you (Resources). Now we’ll explore a critical third component to affordability/affordology: that of Return. Chart: College is a No-Brainer, Right? Above is the sort of chart that drives seventeen million students to college each year and why the rising costs of tuition haven’t put a damper on enrollment numbers. Recently the Federal Reserve of New York published it as part of their paper, “Do the Benefits of Education Outweigh Their Costs?“. This sort of statistical outlay makes it only seem obvious that going to college pays off. In fact, as the Fed pointed out, on average college graduates will out-earn non-graduates by $1 million dollars over one’s lifetime.